This post follows the Peripheral Blood Mononuclear Cells (PBMCs) tutorial for 2,700 single cells. It was written while I was going through the tutorial and contains my notes. The dataset for this tutorial can be downloaded from the 10X Genomics dataset page but it is also hosted on Amazon (see below). The PBMCs, which are primary cells with relatively small amounts of RNA (around 1pg RNA/cell), come from a healthy donor. There were 2,700 cells detected and sequencing was performed on an Illumina NextSeq 500 with around 69,000 reads per cell. To get started install Seurat by using install.packages(). To follow the tutorial, you need the 10X data. Load required libraries and data. 6 x 6 sparse Matrix of class "dgTMatrix"
MIR1302-10                .              .              .              .              .              .
FAM138A                   .              .              .              .              .              .
OR4F5                     .              .              .              .              .              .
RP11-34P13.7              .              .              .              .              .              .
RP11-34P13.8              .              .              .              .              .              .
AL627309.1                .              .              .              .              .              . 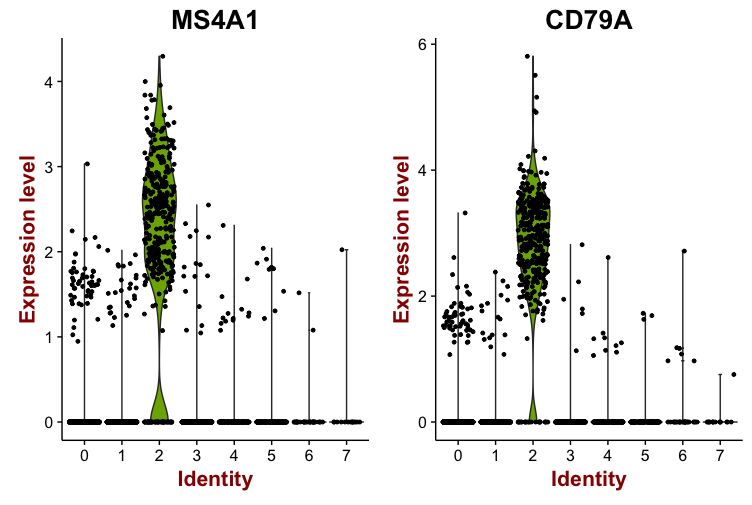 The median number of detected genes among the single cells is 817. 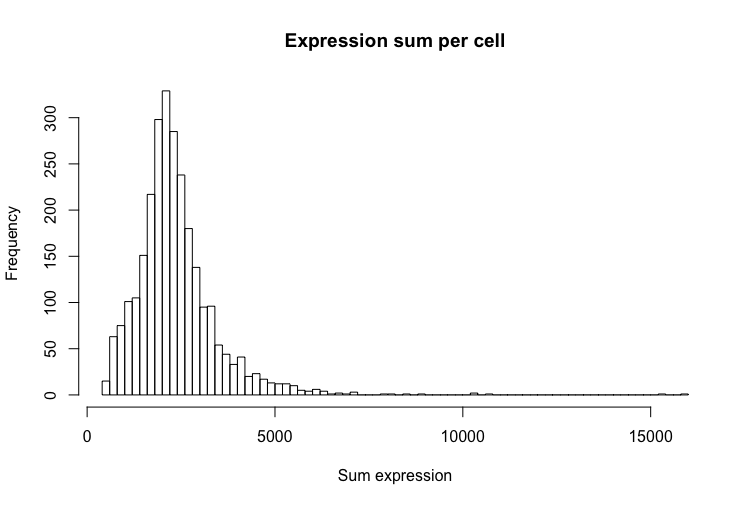 The median sum of expression among the single cells is 2,197. 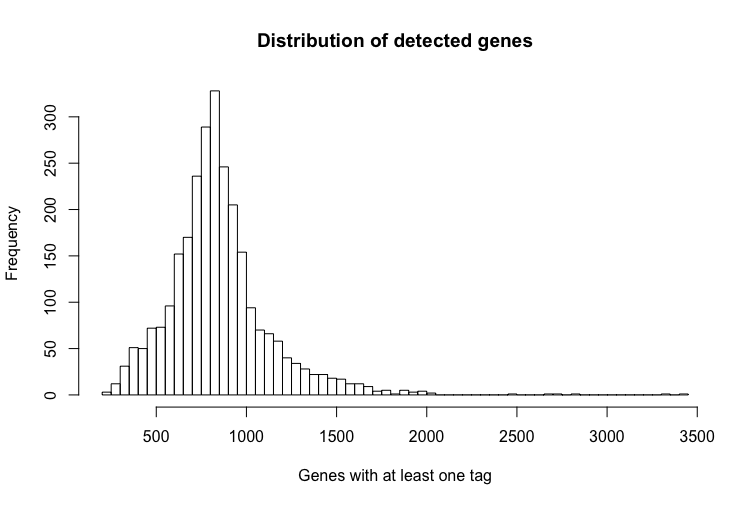 This distribution is very similar to the distribution of detected genes shown above. We will filter out genes and single cells before we continue with the analysis. The tutorial has arbitrary values of keeping genes expressed in three or more cells and keeping cells with at least 200 detected genes. 13714 genes across 2700 samples. "raw.data"     "data"         "scale.data"   "var.genes"    "is.expr"      "ident"        "meta.data"
 "project.name" "dr"           "assay"        "hvg.info"     "imputed"      "cell.names"   "cluster.tree"
 "snn"          "calc.params"  "kmeans"       "spatial"      "misc"         "version"
The tutorial states that “The number of genes and UMIs (nGene and nUMI) are automatically calculated for every object by Seurat.” The nUMI is calculated as num.mol <- colSums(object.raw.data), i.e. each transcript is a unique molecule. The number of genes is simply the tally of genes with at least 1 transcript; num.genes <- colSums(object.raw.data > is.expr) where is.expr is zero. A common quality control metric is the percentage of transcripts from the mitochondrial genome. 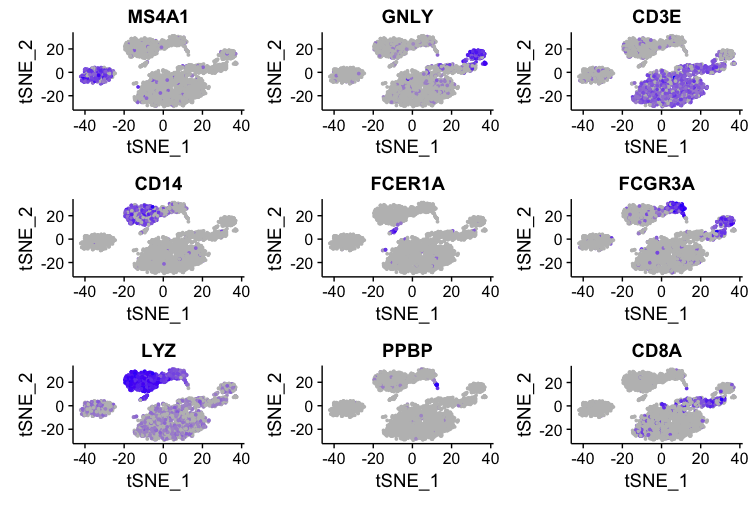 According to the paper “Classification of low quality cells from single-cell RNA-seq data” the reason this is a quality control metric is because if a single cell is lysed, cytoplasmic RNA will be lost apart from the RNA that is enclosed in the mitochondria, which will be retained and sequenced. A couple of cells have high mitochondrial percentage which may indicate lost of cytoplasmic RNA. The GenePlot() function can be used to visualise gene-gene relationships as well as any columns in the seurat object. 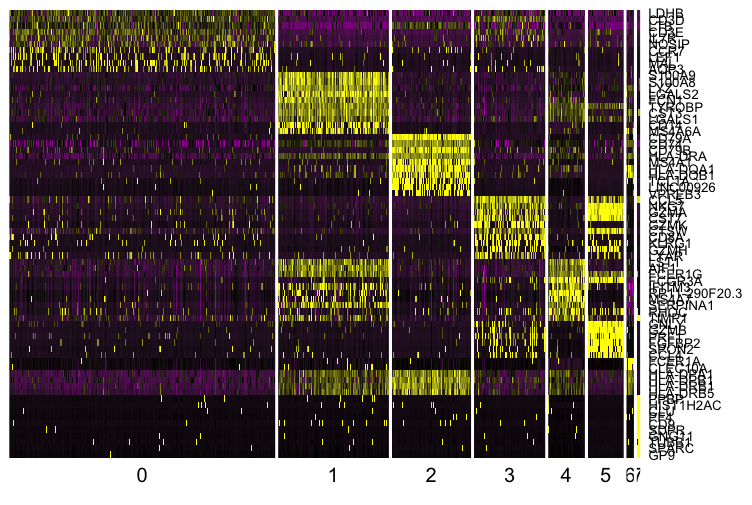 Below we use the plotting function to spot cells that have a high percentage of mitochondrial RNA and to plot the relationship between the number of unique molecules and the number of genes captured. Left: There are some clear outliers in mitochondrial RNA vs. the poly-A selected RNA. Right: The more unique molecules captured, the more genes that are probed. Next we’ll use the FilterCells() function to subset the pbmc object based on the number of genes detected in each cell and by the percent mitochondria. Two thresholds need are specified for each filter, a low and a high; -Inf and Inf are used if you only want to specify a lower or upper bound respectively. Cells that have less than 200 genes and more than 2,500 genes and over 5% mitochondrial content are filtered out. 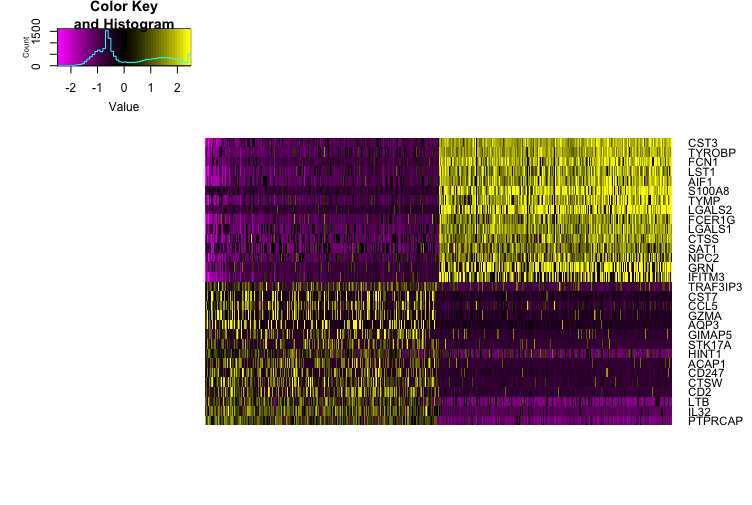 13714 genes across 2638 samples. The next step is to normalise the data, so that each cell can be compared against each other. At the time of writing, the only normalisation method implemented in Seurat is by log normalisation. 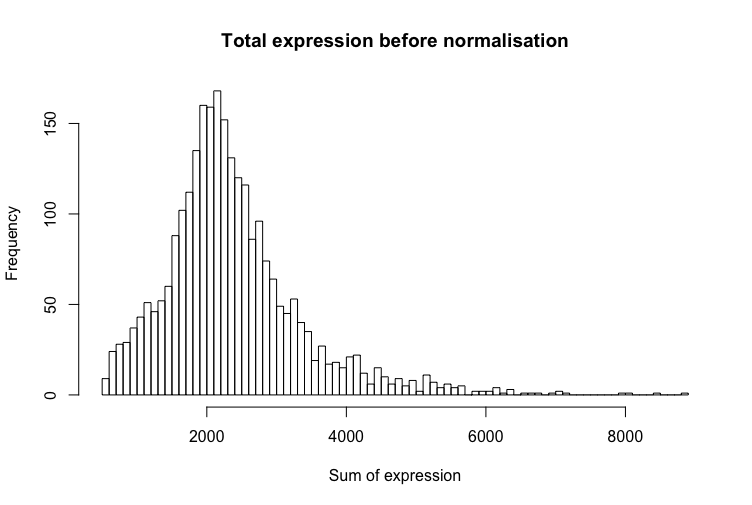 Gene expression measurements for each cell are normalised by its total expression, scaled by 10,000, and log-transformed. Once the data is normalised, the next step is to find genes are vary between single cells; genes that are constant among all cells have no distinguishing power. The FindVariableGenes() function calculates the average expression and dispersion for each gene, places these genes into bins, and then calculates a z-score for dispersion within each bin. 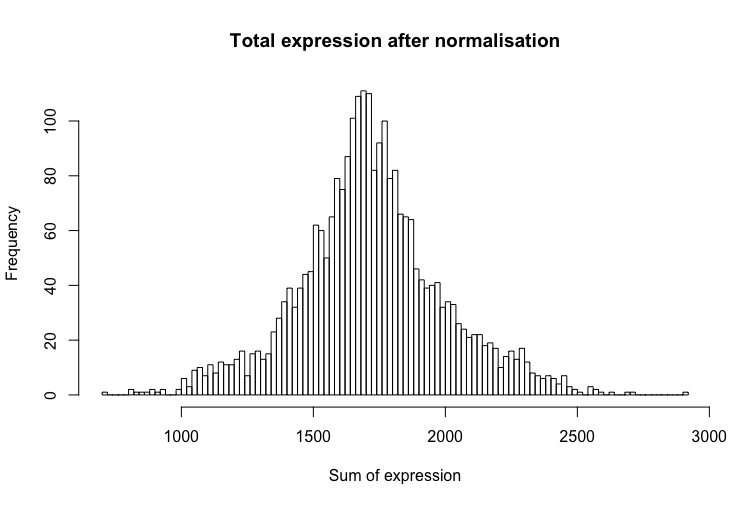 I interpret that as take each gene, get the average expression and variance of the gene across the 2,638 cells, categorise genes into bins (default is 20) based on their expression and variance, and finally normalise the variance in each bin. This was the same approach in Macosko et al. and new methods for detecting genes with variable expression patterns will be implemented in Seurat soon (according to the tutorial). The parameters used below are typical settings for UMI data that is normalised to a total of 10,000 molecules and will identify around 2,000 variable genes. The tutorial recommends that users should explore the parameters themselves since each dataset is different. "TNFRSF4"  "CPSF3L"   "ATAD3C"   "C1orf86"  "RER1"     "TNFRSF25"
Values for the x-axis are in pbmc@hvg.info$gene.mean and values for the y-axis are in pbmc@hvg.info$gene.dispersion.scaled. Seurat constructs linear models to predict gene expression based on user-defined variables to help remove unwanted sources of variation. The idea is that confounding factors, e.g. 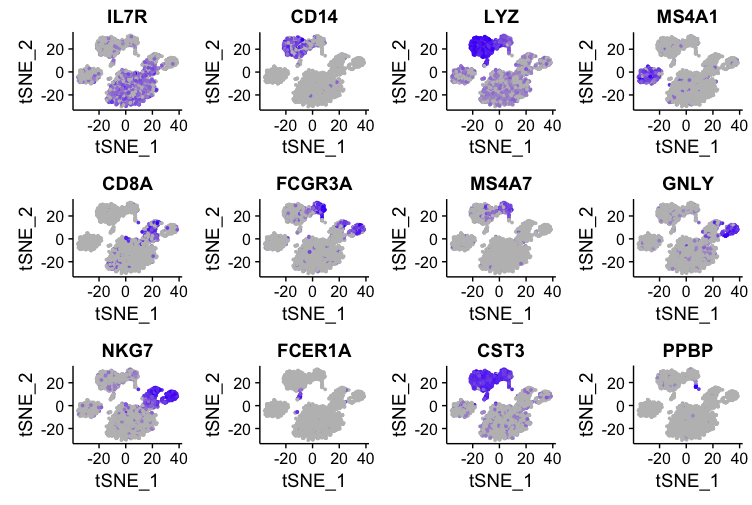 batch effects and cell cycle stage, affect the observed gene expression patterns and one should adjust for these factors to infer the “correct” gene expression pattern. Buettner et al. demonstrate how correcting for confounding factors improved their downstream analyses. The example provided in the tutorial used the number of detected molecules per cell and the percentage mitochondrial RNA to build a linear model. The scaled z-scored residuals, i.e. how much the actual expression differs from the linear model, are stored in the scale.data slot, which are used for dimensionality reduction and clustering. 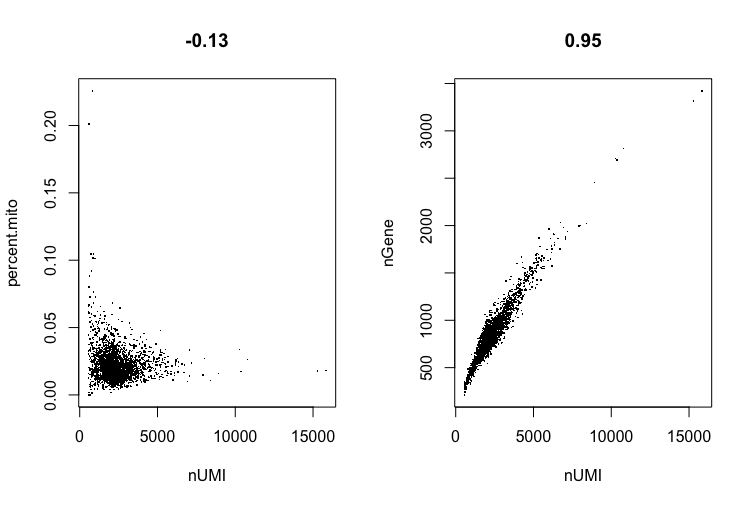 "Regressing out nUMI"         "Regressing out percent.mito"
The dimension of our dataset is 13714 by 2638; however many genes and single cells are not interesting because they don’t vary a lot. One goal of Principal Component Analysis (PCA) is to find the direction/s (usually the first two principal components) in which there is the most variance. The RunPCA() function performs the PCA on genes in the @var.genes slot by default and this can be changed using the pc.genes parameter. The PrintPCA() function outputs a set of genes that most strongly define a set of principal components. "PTPRCAP" "IL32"    "LTB"     "CD2"     "CTSW"
 "CST3"   "TYROBP" "FCN1"   "LST1"   "AIF1"
 "NKG7" "GZMB" "PRF1" "CST7" "GZMA"
 "CD79A"    "MS4A1"    "HLA-DQA1" "TCL1A"    "HLA-DQB1"
Furthermore, Seurat has various functions for visualising the cells and genes that define the principal components. 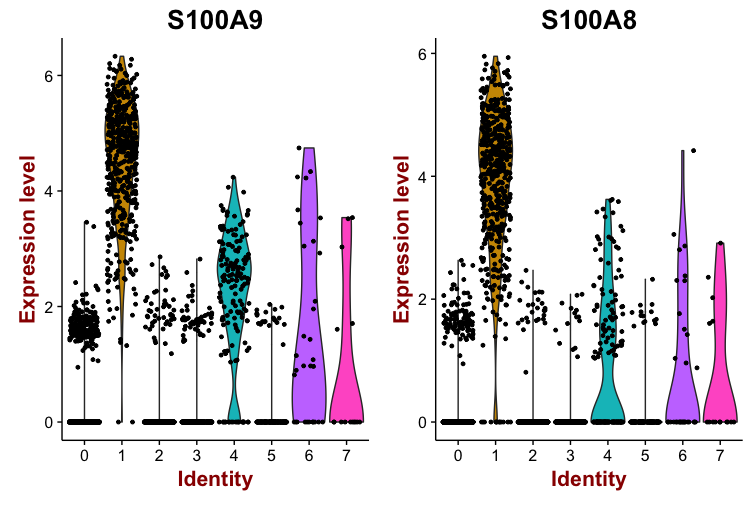 The PCAPlot() function plots the principal components from a PCA; cells are coloured by their identity class according to pbmc@ident. 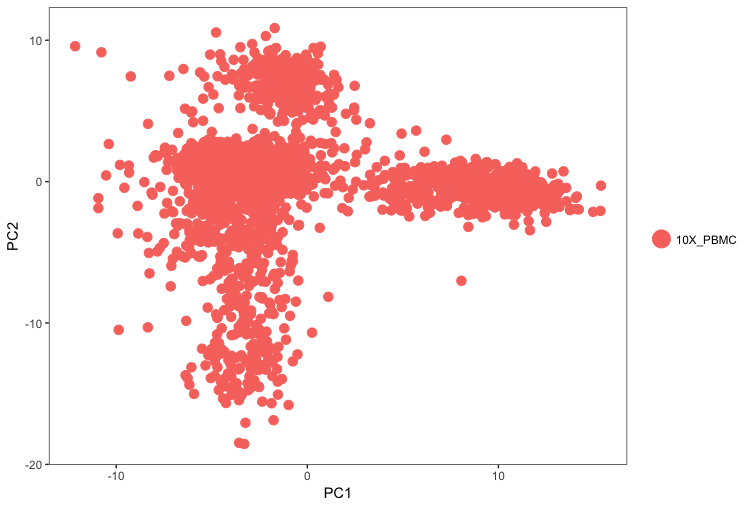 However, the PCA was only performed on the most variable genes, which is a subset of the dataset. 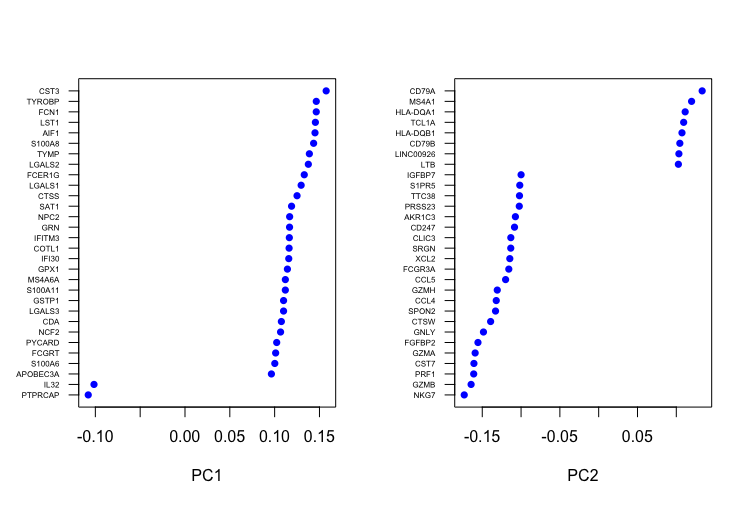 The ProjectPCA step scores each gene in the dataset based on their correlation with the calculated components. 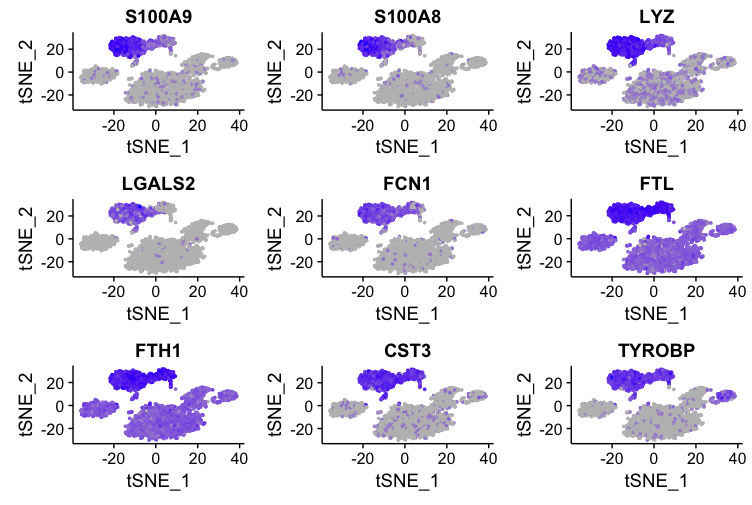 This is useful because there may be genes that were not detected as variable genes in the variable gene selection step, which are still strongly correlated with cellular heterogeneity. 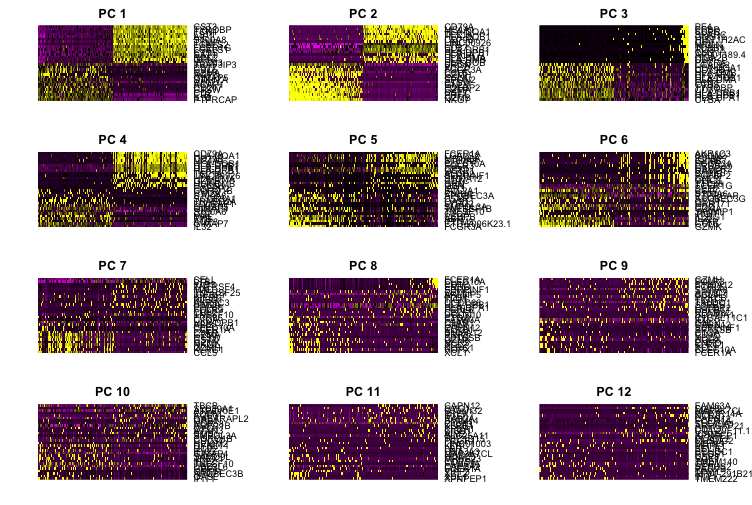 The PCHeatmap() function produces a heatmap based on the PCA; by default the function uses the first principal component and plots 30 genes across the number of cells specified in cells.use. Setting cells.use to a number plots the “extreme” cells on both ends of the spectrum, which dramatically speeds plotting for large datasets. Discrepancy: Rowv is FALSE, while dendrogram is `both'. Omitting row dendogram. Discrepancy: Colv is FALSE, while dendrogram is `column'. Omitting column dendogram. Plotting on 12 principal components. The next steps are to determine how many principal components to use in downstream analyses, which is an important step for Seurat. The tutorial goes through two methods: one uses a statistical test based on a random null model, which is time-consuming for large datasets due to the resampling and may not return a clear cutoff and the other is a commonly used heuristic. The statistical test is carried out by the JackStraw() function, which randomly permutes a subset of data, and calculates projected PCA scores for these “random” genes. 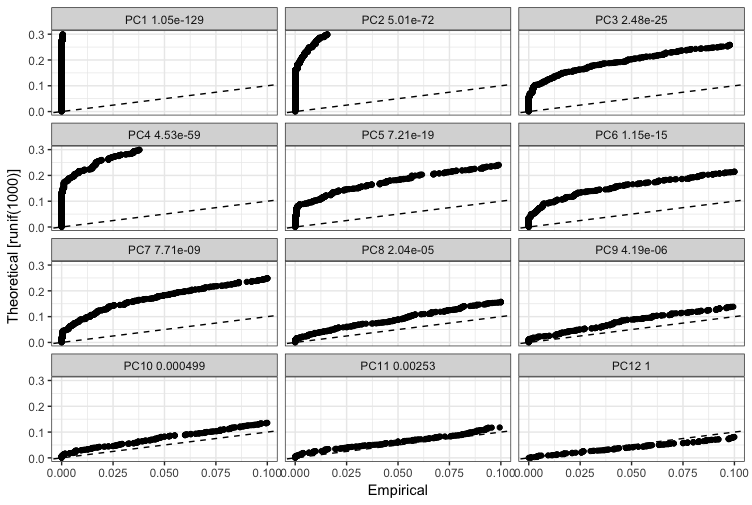 Then compares the PCA scores for the “random” genes with the observed PCA scores to determine statistical significance. End result is a p-value for each gene’s association with each principal component. This resampling test was inspired by the jackstraw procedure. 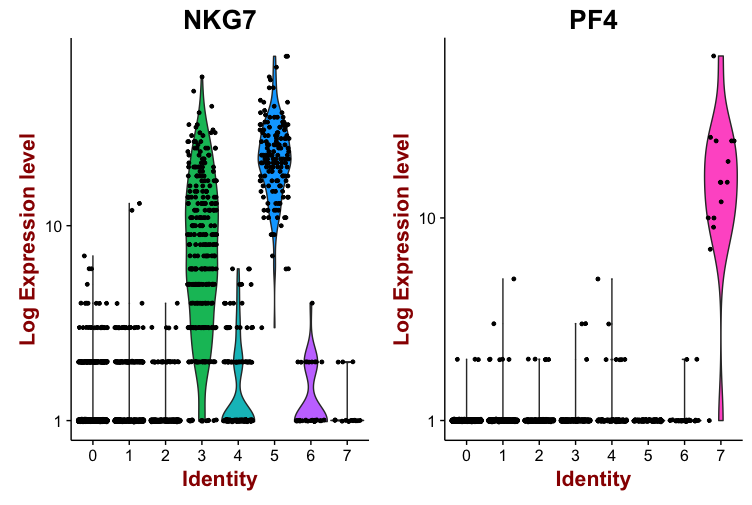 Significant principal components are those with a strong enrichment of low p-value genes. # NOTE: This process can take a long time for big datasets, comment out for expediency. The JackStrawPlot() function provides a visualisation tool for comparing the distribution of p-values for each principal component with a uniform distribution (dashed line). “Significant” principal components will show a strong enrichment of genes with low p-values (solid curve above the dashed line). Removed 17469 rows containing missing values (geom_point). In this case, it appears that principal components 1 to 10 are significant. Another approach for deciding how many principal components to use is to examine the standard deviations of the principle components, which is performed by the PCElbowPlot() function. A cutoff can be drawn where there is a clear elbow in the graph. It looks like an elbow would fall around principle component 9. Briefly, these methods embed cells in a graph structure (e.g. a K-nearest neighbour (KNN) graph) with edges drawn between cells with similar gene expression patterns, and then attempt to partition this graph into highly interconnected “quasi-cliques” or “communities.” As in PhenoGraph, we first construct a KNN graph based on the Euclidean distance in PCA space, and refine the edge weights between any two cells based on the shared overlap in their local neighbourhoods (Jaccard distance). To cluster the cells, we apply modularity optimisation techniques SLM, to iteratively group cells together, with the goal of optimising the standard modularity function. The FindClusters() function implements the procedure above. The resolution parameter adjusts the granularity of the clustering with higher values leading to more clusters, i.e. higher granularity. According to the authors of Seurat, setting resolution between 0.6 – 1.2 typically returns good results for datasets with around 3,000 cells. The clusters are saved in the @ident slot of the Seurat object. # No Java runtime present, requesting install. Seurat can perform t-distributed Stochastic Neighbor Embedding (tSNE) via the RunTSNE() function. According to the authors, the results from the graph based clustering should be similar to the tSNE clustering. This is because the tSNE aims to place cells with similar local neighbourhoods in high-dimensional space together in low-dimensional space. The min.pct argument requires a gene to be detected at a minimum percentage in either of the two groups of cells, and the thresh.test argument requires a gene to be differentially expressed (on average) by some amount between the two groups. You can set both of these to 0, but with a dramatic increase in time – since this will test a large number of genes that are unlikely to be highly discriminatory. As another option to speed up these computations, max.cells.per.ident can be set. This will downsample each identity class to have no more cells than whatever this is set to. While there is generally going to be a loss in power, the speed increases can be significant and the most highly differentially expressed genes will likely still rise to the top. 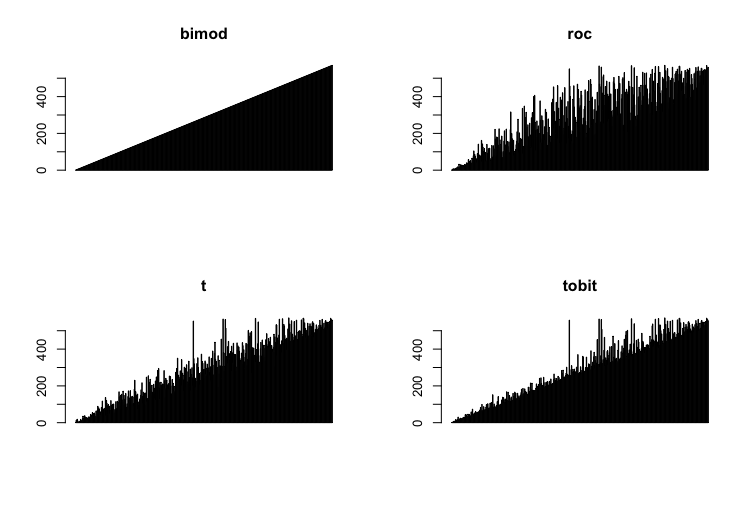 Let’s compare the four different DE methods for defining cluster 1. 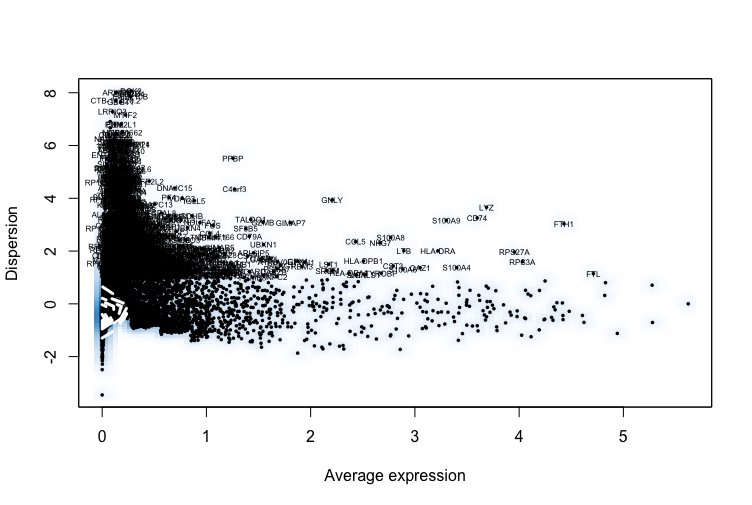 "0" "1" "2" "3" "4" "5" "6" "7"
The VlnPlot() and FeaturePlot() functions can be used to visualise marker expression. 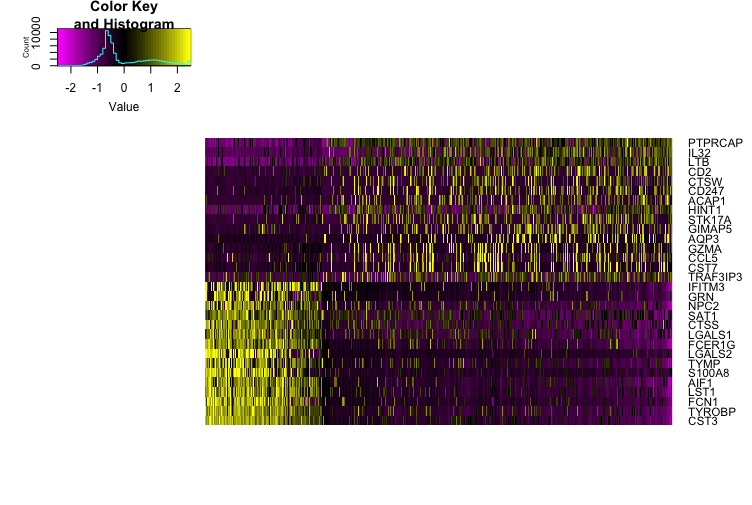 The DoHeatmap() function creates a heatmap of genes across all cells. Below, we use plot the top 10 marker genes for the eight clusters. 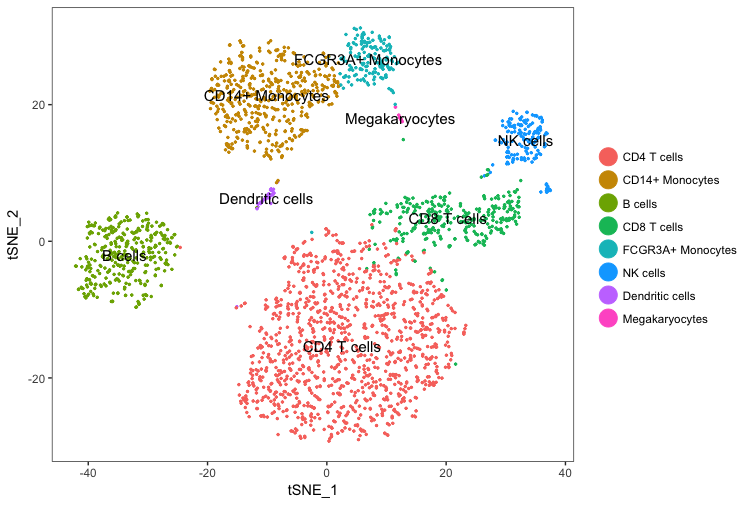 There are canonical markers for each cell type, which can be used to assess the clustering. Seurat provides the StashIdent() function for keeping cluster IDs; this is useful for testing various parameters and comparing the clusters. For example, adjusting the parameters may lead to the CD4 T cells subdividing into two groups. Thanks! This is very helpful in understanding their tutorial a bit more. Could you elaborate on why scaling and centering the data is useful for dimension reduction? I get the purpose of regressing out unwanted heterogeneity that they’ve coupled into the scaling step, by why shouldn’t you just PCA and tSNE on the log normalized data? thanks for the comment. I guess you are referring to ScaleData() step? If you are, the residuals are used as weights for dimension reduction to take into account confounding factors https://github.com/satijalab/seurat/issues/49#issuecomment-300980453. do u know how to analysis two timepoint cells with addmetadata? Thank you so much! I have read your two blogs about monocle and seurat. And they have helped me a lot in the analysis of scRNA-seq. And i want to know that as there are many sofawares including monocle and seurat,what should we choose for analysis? As i know, cellrangerRkit can also do clustering, DEG analysis as seurat. And SC3 is a new software for clustering which is used in some papers. So what’s the difference between these softwares and how can i choose the suitable one? No problem and glad you found the posts useful. Have a look at https://www.scrna-tools.org/categories to find a suitable tool for what you need. Thanks! This tutorial is very helpful! I have a question, in the GenePlot of percent.mito vs nUMI, the title the -0.13, what does it represents? Looking at the source code for the GenePlot(), it should be the Pearson correlation between the two variables (percent.mito vs nUMI). Thank you so much for your blog on Seurat! I have a question on using FindMarkers, I’d like to get statistical result on all variable genes that I input in the function, and I set logfc.threshold = 0, min.pct = 0, min.cells = 0, and return.thresh = 1. But there are still a couple hundred genes missing from the output. Am I doing something wrong here?? and is there other way to get all the variable genes? Hi Yuri, thanks for the comment. Actually, this is a question that interests me as well, since I had wanted to perform a GSEA and needed the fold change and p-values of all genes but just like you I couldn’t get the full list of genes back. You can ask the developers at https://github.com/satijalab/seurat. Thanks for the tutorial, it is very helpful. I have a question, how does one get from the TSNE calculation, Cell to Cluster identity data- I would like to have have a column of all the cells and their corresponding Cluster attribute for example. The cluster identity will be stored in the meta.data slot; the cell identifiers are the row names. Thanks for the tutorial. It’s very useful. 1) The plots generated using VizPCA, what does the values on the x-axis means? 2) I am slightly confused with the jackstraw procedure. Could you please clarify if my understanding below is correct? 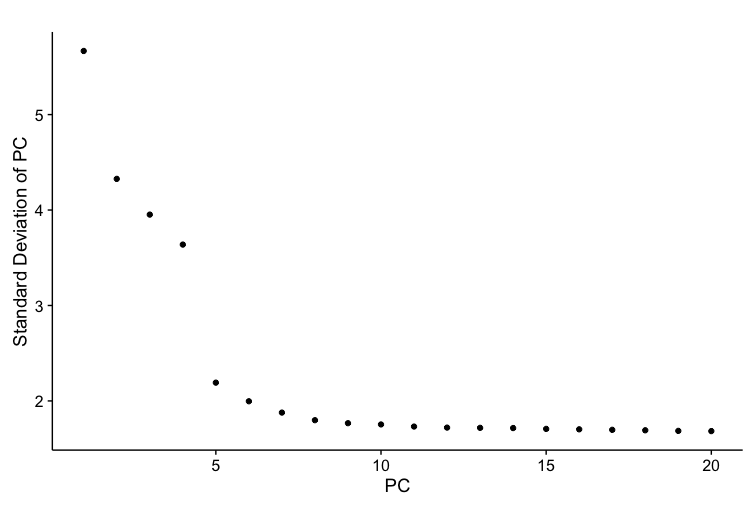 2nd: Perform PCA to get PCA scores – what are PCA scores? 3) I also don’t understand the last statement in the jackstraw procedure – “End result is a p-value for each gene’s association with each principal component.” The p-value is the association of the PC with the random subset of genes isn’t it? Not each gene’s association right? Could you please explain? I’m rather confused here. 4) What does the SD of PC means in the Elbow plot? How is this SD calculated? Thank you for nice and kind tutorial. This is really helpful for me. I have a question about data handling and plotting. I’m using 10x data generated from 3 different sample (aggregated data). I’ve successfully marked each cluster with cell type based on marker gene expression according to this tutorial. But, I can’t know which cluster(cells) come from which samples. 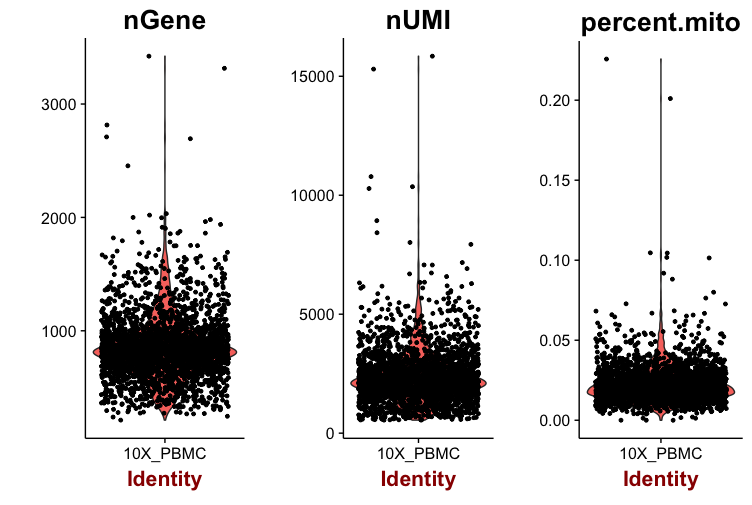 Can I mark sample identity together with cluster name (or marker gene) in a single plot? If you add the relevant information to the meta.data slot using the AddMetaData() function, you can use ggplot2 and map the meta data to various aesthetics in a scatter plot. Thank you for your blog on Seurat and Monocle! I have a question: I want to do cell cluster by Seurat, and use the result of treatment from Seurat to construct trajectories by Monocle. What should I do to get the data that Monocle can read in? Thank you. You can get the cell cluster information from the meta.data slot in the Seurat object and add this to the Monocle object as phenoData. Similarly, you can output the data in the raw.data slot of the Seurat object and use it as the expression matrix when creating the Monocle object. Thanks a ton for theses blogs. Helped me a lot. I have a doubt. 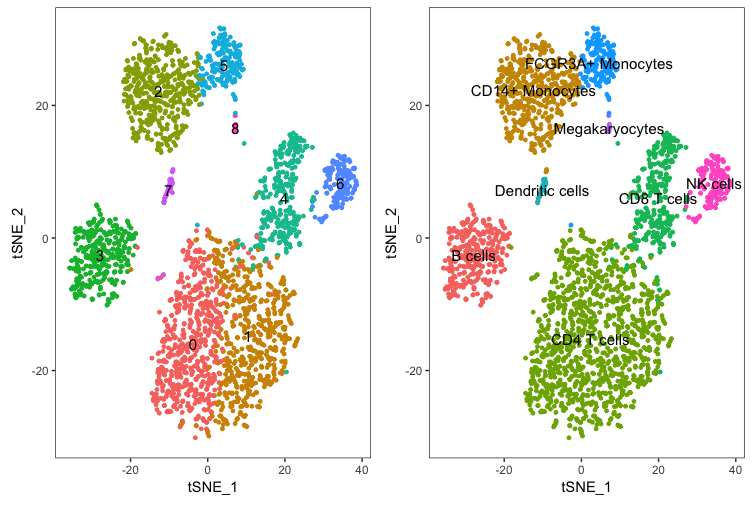 I wanted to use SingleR, a new package to annotate the cell type from single cell rna seq Data. I did all other analysis in Seurat. So I wanted to use expression matrix from Seurat in SingleR. So I used object@data in place of matrix and out worked fine. But I see that object@data is only normalized expression matrix. The data where nUMI, percent.mito regreesed out is found in object@scale.data. But I think scaling introduces negative expression values or something, because SingleR annotation goes haywire if I use object@scale.data. The two arguments in the scale.data function of Seurat- do.scale and do.center, Can any of these be helpful to me to create the most nearest Seurat object for annotation? I haven’t used SingleR yet but yes, the scaling step does introduce negative values. If you set the center to FALSE, it shouldn’t perform the centering, and that should leave you with only positive values. I was wondering if you had any advice regarding the selection of highly variable genes? They suggest playing with the parameters until it the plot marks outliers, but I’m not 100% on interpreting the plot and where exactly I should be looking for these outliers? I’m worried as it seems like an important step as you run the PCA based on these genes. In my project, I merged four different single cell RNA-seq data set into one Seurat object and did Louvain clustering on the object. 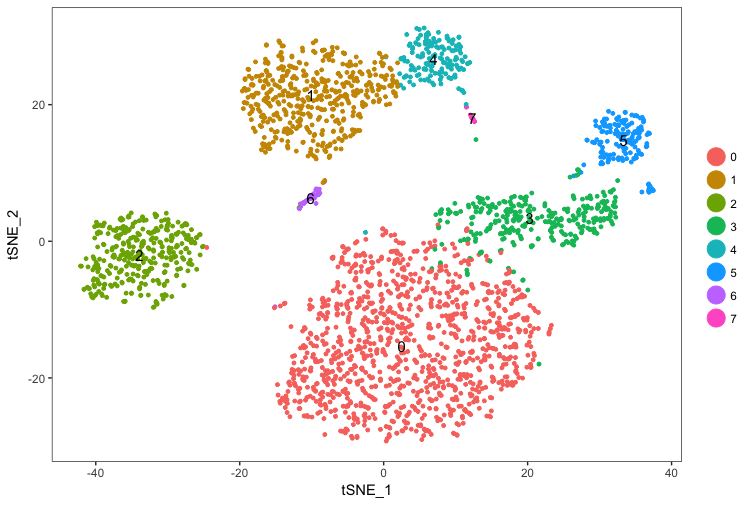 In the resulted t-SNE I want to know what proportion of each cluster is made by different samples. Do you have any suggestion to do that? the meta data slot in the Seurat object contains the cluster membership numbers. If you have the sample factors in the meta data, you can simply use the table() function in R to create a table of cluster vs. samples. This is my understanding is “for each cell how many genes have more than one transcript”, i.e. for C1, G3, G4 and G5 have more than one transcript and so on.